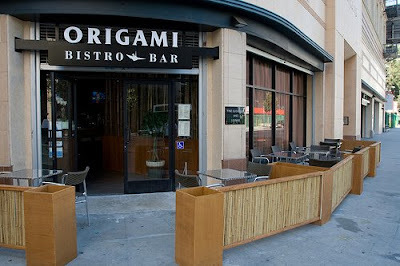 If you work or live in or near Downtown L.A., Origami Bistro & Bar's Happy Hour is a good way to enjoy good food and a cool vibe during these recessionary times. Origami offers Asian fusion food served in the now ubiquitous "small plates" style (aka tapas or izakaya style, long before the current mainstream trend). And the raw fish offerings are pretty good - not premium, but good enough quality to warrant regular visits by RawFishionado - but only at Happy Hour, when you can get two fist-sized Hama Hama oysters on a half shell for $2.95 and decent salmon and snapper nigiri for $2.50 (2 pieces per order). I'm afraid I don't have any photos of our Happy Hour eats late Sunday night because my friends and I dropped by on a whim and didn't have a camera with us. My two gal pals and I headed to Origami for drinks after enjoying several hours of great music, dancing and people watching at the Cuban Festival just up Spring Street, at the 740 club. I'd passed by Origami several times in the past and admired the decor (sleek woods, pretty lighting and a wall of subtly sparkly mosaic tiles), and wondered how the food stacked up. Post-Cuban Festival seemed a perfect time to stop in for a snack. There are 23 items (some raw, most cooked) on the Happy Hour menu, ranging in price from the $1 Kobe Beef Taco to the $8.95 Super Tuna Roll. Besides the aforementioned nigiri sushi and oysters (which were topped with green onions and a dash of wasabi, garlic and ponzu sauce), my friend Stacey also enjoyed an order of the Shrimp Tempura Tacos (2 pieces for $2.95) that were satisfyingly tasty. There was only one other table of three in the dark, lounge-y spot on this Sunday night. We had a very green, new waiter (just two days on the job) but he won us over with his enthusiasm and honesty. With Little Tokyo's authentic Japanese food just a few blocks down the way, I can't see myself ever going to Origami for a full meal. But I'll definitely return to Origami for Happy Hour - especially the late-night version, when it's harder to find inexpensive but craving-worthy food in a nice atmosphere.